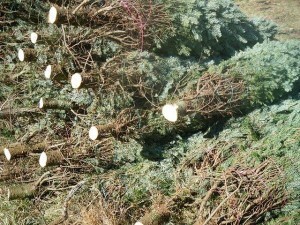 Estimated wholesale value of Christmas tree crops harvested. The retail value is $250 million or more. These trees won’t be in the sun long. They will be placed in storage before shipping. Estimated retail of value-added products produced by North Carolina Christmas tree growers including wreaths, roping, swags, table decorations, and mailbox decorations. Amount of greenspace available to wildlife for each Christmas tree grown. Least amount of times each Christmas tree is visited to be shaped, fertilized, and otherwise cared for. Age of some eastern grown species when harvested. Fraser fir, which is slower growing, is typically 10+ years to harvest. 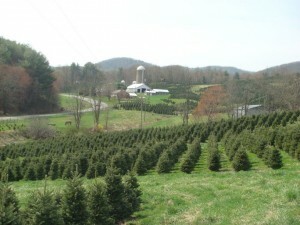 Christmas tree species grown in North Carolina for Christmas trees. Trees include Fraser fir, Canaan fir, Concolor fir, Nordmann fir, Turkish fir, blue spruce, Norway spruce, white spruce, eastern red cedar, Leyland cypress, ‘Carolina Sapphire’ Arizona cypress, ‘Blue Ice’ Arizona cypress, ‘Green Giant’ arborvitae, white pine, Virginia pine, and Scotch pine. However, 96% or more of production is the state’s native tree, Fraser fir. Amount of waste from a cut Christmas tree — a completely recyclable, renewable product. • Chapter 2 – Why Fraser Fir?